These toasty bite-size appetizers will disappear in minutes. 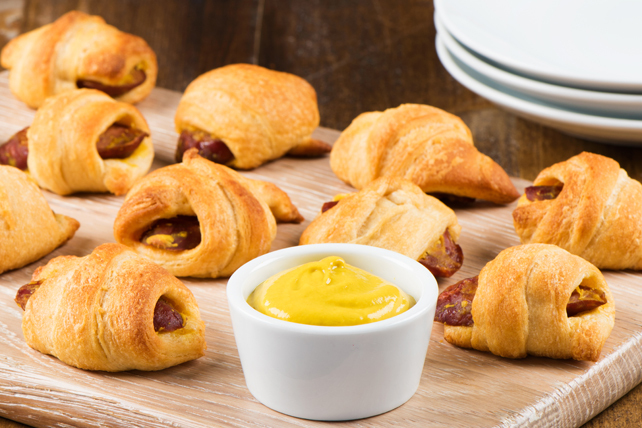 The flaky crescent dough is stuffed with chorizo sausage and dipped into a Jalapeño Mustard. Place chorizo in medium bowl. Add 2 Tbsp. mustard; mix lightly. Unroll crescent dough; separate into 8 triangles. Cut each triangle lengthwise in half. Place 1 sausage slice on short side of each triangle; roll up, starting at chorizo-topped side. Place, point sides down, on baking sheet. Bake 12 to 15 min. or until golden brown. Serve warm with remaining mustard. Prepare poppers as directed except do not bake. Refrigerate up to 4 hours before baking as directed.